Hitachi Healthcare Americas introduced a new premium 2D and 3D cardiovascular ultrasound system, the LISENDO 880, at the annual meeting of the American Society of Echocardiography held in Baltimore this month. It is now the most advanced ultrasound system in Hitachi’s product line. The LISENDO 880 is Hitachi’s new premium 2D and 3D diagnostic ultrasound solution for cardiologists designed to redefine the vision for cardiac ultrasound by providing exceptional clinical performance with state-of-the-art features and analytics. State of the art probe technology for 2D and 3D imaging, a high performance OLED display, premium image optimization parameters such as eFocus and Pure Symphonic Architecture to capture the subtlest of changes and produce the highest-quality “sound”. A seamless workflow, designed to provide maximum scanning comfort and state-of-the-art technology to complete exams easily and efficiently. The system’s flexible positioning, including an adjustable panel height and a four-point articulating arm, support comfortable operation while the operation panel enables ergonomic function adjustment as a part of our intuitive user interface. The Smart Cardiac Measurements provide automated analysis to enhance examination efficiency. Premium 2D and 3D cardiovascular applications including Dynamic 3D evaluation, LVeFlow, Dual Gate Doppler, Eyeball EF, 2DTT, and FAM. These applications are designed to provide solutions for the most difficult clinical challenges. Applications like VFM, eTracking and Wave Intensity move hemodynamic evaluations beyond the basics. An adjustable panel height and a four-point articulating arm support comfortable operation while the operation panel enables ergonomic function adjustment as a part of an intuitive user interface. The Smart Cardiac Measurements provide automated analysis to enhance examination efficiency. These features enable the LISENDO 880 to deliver seamless workflow users expect in a premium ultrasound system. 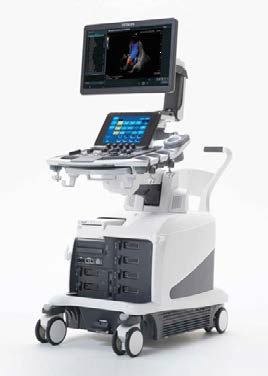 2D and 3D cardiovascular ultrasound system introduced by Hitachi Healthcare Americas. Appl Radiol.